After yesterday's late finish we didn't set off walking from Shenavall until after 9:30am. The river crossing wasn't too tricky as it was no more than knee deep; however according to the bothy book it had been impassable only a few days before. After crossing a boggy area, we headed steeply up the NW shoulder of Beinn a'Chlaidheimh. 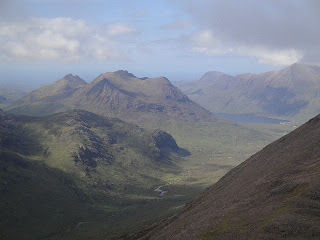 This was hard work and it seemed to go on forever; however there were excellent views over to Beinn Dearg Mor and An Teallach. Eventually we reached the ridge line and followed a pleasant well defined ridge to the summit of Beinn a'Chlaidheimh (Corbett), which we reached at about 12:45pm. It was mainly overcast, but dry with the cloud above the summits; hence the views from here were excellent. After having lunch on the summit, we set off down the south ridge, dropping to a relatively low bealach at 650m where there was a tent pitched. To avoid the quartzite scree on the next peak we instead skirted to the right and up the coire. 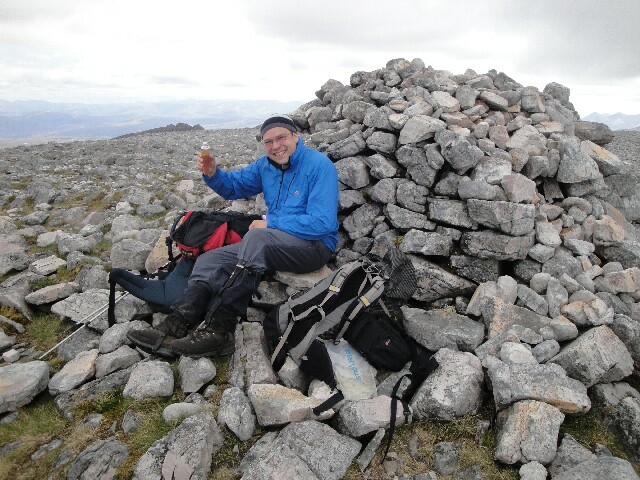 We reached the summit of Sgurr Ban (Munro) at around 3pm and had a wee celebrationary dram by the summit cairn as this was my 200th Munro! 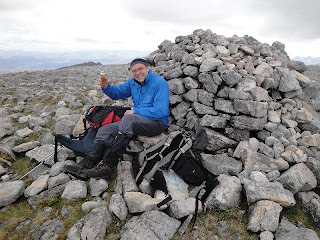 After descending down to the next bealach we ascended steeply up a scree path to reach the summit of Mullach Coire Mhic Fhearchair (Munro), which we reached soon after 4pm. Again the views from here were excellent and extensive across the heart of the Fisherfield and Letterewe forests. We descended steeply to a bealach before taking a traversing path around the NW side of Meall Garbh to reach another bealach. From here we ascended up to the top of our 4th Munro of the day reaching the summit of Beinn Tarsuinn (Munro) at approx 5:45pm. By now the sun had come out and it was quite warm. There were good views north down the valley towards An Teallach. 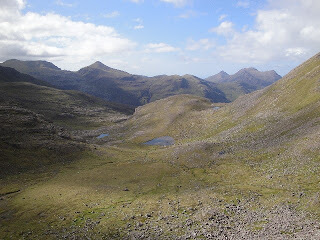 We had planned to continue over A Mhaighdean and Ruadh Stac Mor, but due to the time we decided to descend back to the bothy instead. The NW ridge of Beinn Tarsuinn was interesting with a prominent table part way along. We traversed the ridge and eventually found a way through the crags at its northern end. There was then a long walk back north alongside the river to Larachantivore followed by two river crossings to get back to Shenavall, where we arrived just before 11pm. A very long day!